What are some ingredients of successful relationship? Casual discussions about relationships and finding the right partner for yourself. Fun! Learn and discuss with others in a pleasant atmosphere and environment! Note: we will not store your email address. It's solely for us to be able to send you a notification and more details about this event! Who: Single people, those in relationships - basically any and all young adults! Basically, it's a reason to get together! 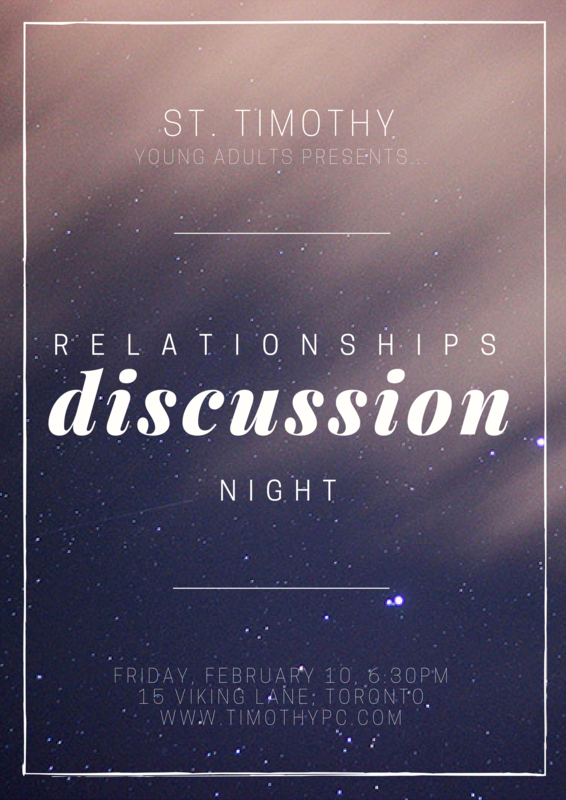 We'll have a fun time discussing relationships. We'll have discussions in smaller groups and as a whole group. There will be food, wine and snacks to make for a nice casual atmosphere where we can have good and meaningful conversations! The event will be at Simon Park's condo party room. It's right beside Kipling station. There is also ample visitor parking. So TTC or drive, it's your choice!